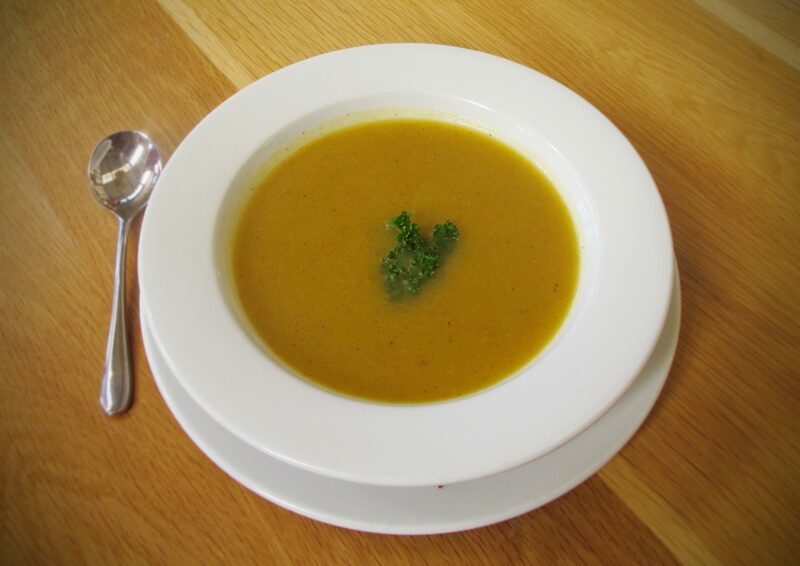 The pumpkins are freshly harvested, the nights are drawing in and there’s a definite nip in the air – what better time to enjoy our Hearty Pumpkin Soup? This recipe serves between 6-8 people. Peel and cut the pumpkin, carrots and butternut squash into inch size cubes. Lightly drizzle with oil and spread onto a baking tray in a single layer. Roast at 180OC for 20 minutes until soft. Fry off the celery, onion and garlic in a little oil until soft but no colour. Add the white wine and cook until it’s evaporated. Add the nutmeg, salt, pepper and cinnamon and cook for another 2 minutes, stirring throughout. Once soft, add the pumpkin and butternut squash to the pan along with veg stock and simmer for 10 minutes. Remove from the heat. Put the contents of the pan into a blender and blitz. Taste and adjust seasoning to your own taste. Serve with a chunk of crusty bread from Hollow Trees too!